Phelps won the hearts of Americans last August by winning eight gold medals at the Summer Olympic Games in Beijing. 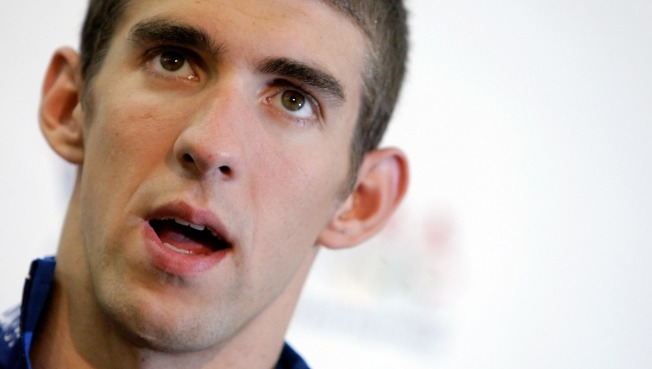 Tarnished swimmer Michael Phelps talked to reporters in San Diego Saturday at the Chula Vista Olympic Training Center. He discussed the scandal after a photo emerged of him smoking from a 'bong,' the fallout and support from his sponsors, plus an epiphany he had one recent Sunday that brought him to San Diego and put him back in the pool. Phelps won the hearts of Americans last August by winning eight gold medals at the Summer Olympic Games in Beijing. Phelps had a tougher start to 2009, however, when a picture of him appearing to smoke marijuana from a bong surfaced in magazines, newspapers and on television. Phelps has said he is sorry and is looking to restore his image. Phelps and several other Americans are in the middle of a two-week training camp for this summer's national and world championships. They're in the pool twice a day, at 7 a.m. and 5 p.m., and spent part of one day training with U.S. Navy SEALs. After winning a record eight gold medals at the Beijing Olympics, Phelps had by far the most time off from competition he's ever had. It was one Sunday three weeks ago that Phelps says he had an epiphany about his future. "Literally I woke up and it was just something. It was like overnight, something just clicked and it was just a feeling. The next day I called Bob, my mom, my sisters, Peter, called all them and said are you guys ready? They said yeah, they said we're behind you," Phelps said. The star swimmer said he had doubts about getting back in the pool and thought about walking away. "My goal was to do something that no one else had ever done before and to do something that no one has ever seen before. I did that. I just think I didn't know. I think at that time I was really lost about what I wanted to do and where I wanted to go and needed to sort of sit down and think about. You know, if I don't swim, what am I going to do? If I swim, where do I want to go? What do I want to do?" Phelps said he weighed all the options and sat down and talked to a lot of people about it. "Peter actually said to me to sit down with a piece of paper and put pros on one side and cons on the other and weigh out all your options. I got points of view from everybody, but deep down inside I was the one who had to decide what to do. If I still had passion, still had drive, then it was to get back in the pool. I literally woke up one Sunday and was like, what am I doing? Why am I even questioning stopping?" The swimmer says he will swim for four years and then he'll retire. He talked about the "bong" incident and admits he made a big mistake. "It was stupid and it shows how things can turn one way or another. I've been able to learn from all the mistakes I've ever made and that's what I'm doing from this and that's what I plan to continue doing. It seems that whenever I'm out of the water, that's when something happens. Swimming has been such a big part of my life growing up and I've always been in this same routine and same regiment and that's how my life has really been, sort of constructive I guess you can say. At that point it was difficult, it was hard, but I knew all along that I needed to have some structure back to my life and at that point, whether it was getting back in the pool, or whether it was doing something else. My comfort is obviously being back in the pool and there still was a passion, and I'm just happy to be back in the pool and able to train again." Phelps said the scrutiny has not taken from his motivation but he has been looking to his peers for perspective. "I've been talking to some other athletes about it too and there are some athletes who have had problems and I've been able to get their side of it and how they handled it. It's all really about what's in your heart and that's why I'm back in the pool. If it wasn't in my heart I wouldn't be here, I wouldn't be training. I don't know what I'd be doing, but I wouldn't be doing this right now." The incident cost Phelps two sponsors; AT&T and Kellogg's. That cost him some money, but he says it's not about that. "If it was about money I wouldn't be here. When Matt (Lauer) asked me that question about contracts that I've lost, I mean, yeah I've always wanted to be a professional athlete, but to be honest I'm still an 11-year-old kid… I do this because I love it; I'm not doing it because I'm getting paid. Yeah, it's an extra bonus, but if I was in this for the money I'd probably be in a different sport." Phelps says his other sponsors are standing behind him, and he's grateful. "I called every single one of them, I talked to every one apart from AT&T and Kellogg's and they all said we're not happy with this situation, but you're family. I've been sponsored by most of these sponsors for seven or eight years. We've worked together for a long extended time and I've gotten to know pretty much everyone in the company. So it is kind of like family and they said we're behind you 100-percent and we support you and we're not going to turn our back toward you. They've been supportive through this whole thing and that's definitely something that I'm thankful for, to have that support." Not everyone has his back, there's always the person who took the picture in the first place. "Have you talked to the person who took that photo?" a reporter asked. "No, I have no desire to," he replied. When asked if he knew who took the photo, Phelps nodded his head, but would not give a name. He said it's clearly a lesson learned and it just shows that there are people out there that are after things. "It's times like this when you find out who your real friends and family are, and they'll support you through good times and bad times," he said. "People who really stand by you 100-percent are there through every good time and every bad time." Phelps plans to return to competition May 14-17 at the Charlotte UltraSwim. He'll swim in the Santa Clara International Grand Prix in June, participate in an altitude camp, then swim in a meet in Montreal before the national championships. He said he's added 15 pounds since Beijing, and figures it'll probably be the beginning of next year before he's back in top shape. Phelps said his goal this summer is do better than four years ago at the world championships, when he failed to reach the finals of an event for the first time ever.